Did you get it yet? One of the biggest blu-ray’s this year! Ant-Man and The Wasp is available for digital download now, and of course on 4K Ultra HD™, Blu-ray™ and Blu-ray 4K Ultra HD™! I am so excited about this blu-ray for so many reasons that I just couldn’t contain my excitement. 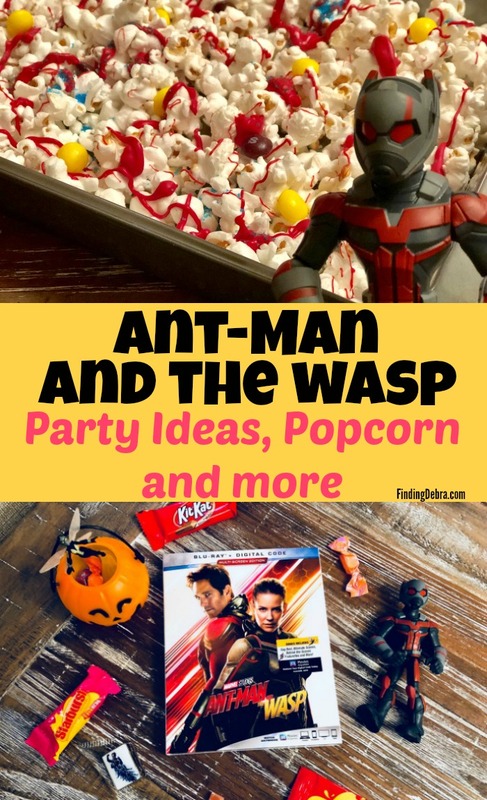 We had to celebrate with some Ant-Man and The Wasp party fun and a giveaway (with 2 winners – read on)! 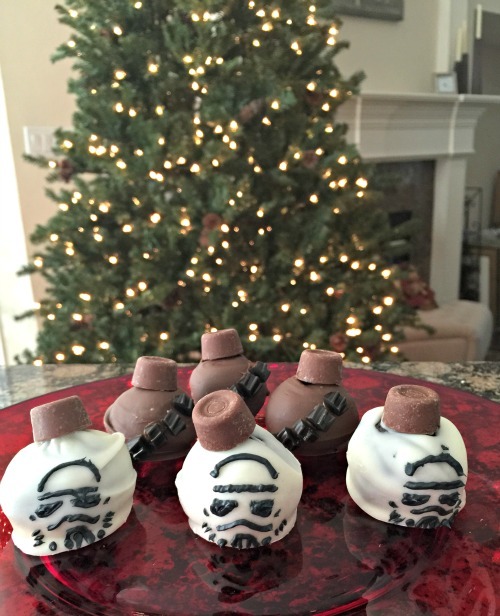 Complimentary items provided by Disney/Marvel + affiliate links in post. Why am so I excited to have this movie in my Marvel library at home? I won’t spoil it all for you, but one reason was that the END CREDIT SCENE was so crucial to all of us who watched Avengers: Infinity War. Haven’t yet seen Ant-Man and The Wasp? No worries, read my Ant-Man and The Wasp Spoiler-Free Scoop here! I had the privilege of interviewing Paul Rudd, Michael Douglas, and Wasp herself, Evangeline Lilly. I’m still pinching myself over that! The Blu-Ray takes us inside the movie for more details with exclusive extras. Featurettes spotlight Paul Rudd, who returns as good-hearted thief turned hero, Scott Lang, and delivers big laughs both on set and in theaters; Evangeline Lilly, who transforms into The Wasp, the first female character to be featured in the title treatment of a Marvel Studios film; and iconic actors Michael Douglas and Michelle Pfeiffer as super couple Hank and Janet Van Dyne. Viewers can explore more about the visual development artists and effects used to bring the characters to life and drastically alter the size of the Super Heroes and their surroundings. 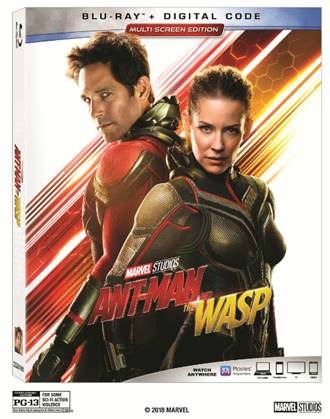 Additional extras include deleted scenes, bloopers, outtakes, and audio commentary by “Ant–Man” franchise director Peyton Reed. In “Ant–Man and The Wasp,” Scott Lang is grappling with the consequences of his choices, as both the Super Hero Ant–Man and a father, in the aftermath of “Captain America: Civil War.” As he struggles to rebalance his home life with his responsibilities as Ant–Man, he’s confronted by Hope van Dyne and Dr. Hank Pym with an urgent new mission to rescue Janet van Dyne from the Quantum Realm. Scott must once again put on the suit and learn to fight alongside The Wasp, all while attempting to serve house arrest, assist fast talking-Luis (Michael Peña) and the X-con Security crew, and thwart the efforts of a new adversary called Ghost (Hannah John-Kamen) and her ally Bill Foster (Laurence Fishburne). 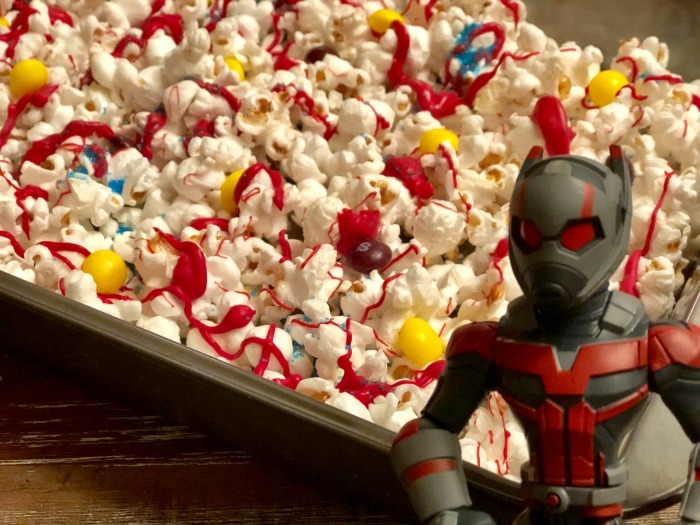 So why not have a little Ant-Man and The Wasp party while watching the movie? First, we must gather all things mini! Why? Well, because size is such a big thing in this movie (as well as the first). Mini candies – head to the candy aisle or online to find miniature chocolates or other fun candies to keep with the theme for snacking fun! Mini toys – head to your local store or shop online to find some of the incredible Ant-Man and The Wasp mini toys that are available! We had so much fun with our mini Ant-Man, Wasp, pumpkin, etc. 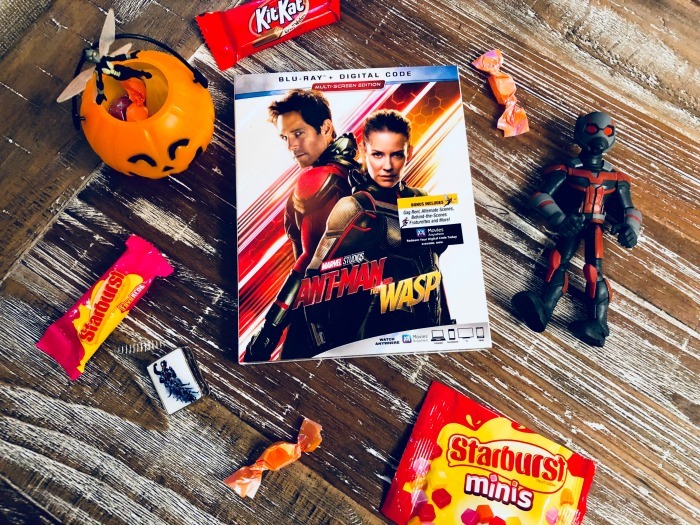 A copy of Ant-Man and The Wasp on Blu-Ray + DVD of course. Then make some homemade or semi-homemade treats. 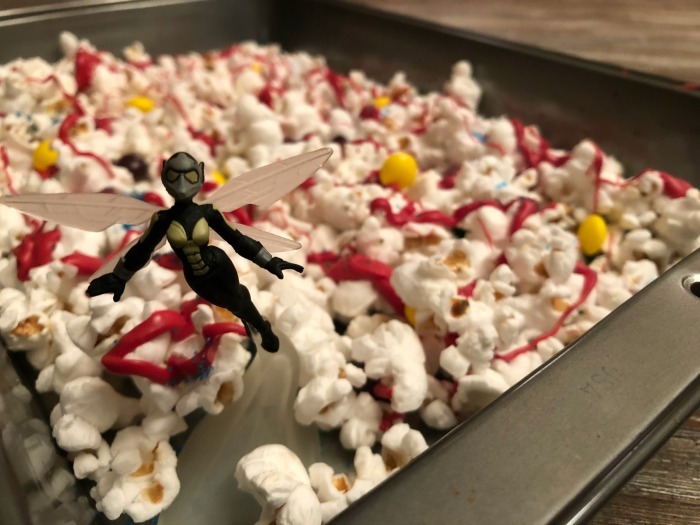 Popcorn, plain – to make it easy, I bought a large bag of pre-popped popcorn, but you can easily make it yourself with an inexpensive popcorn popper. Skittles or M&Ms- I used the yellow and maroon Skittles, but my daughter insists we try M&Ms next time as they are less chewy. Red Wilton Candy Melts – these are the same candy melts I use all the time for recipes like How to Make Chocolate Covered Strawberries – head there for more instructions if you have never used before. Pour popped popcorn into a shallow baking pan or something similar and spread out so it is a thin layer. Add a few Skittles candies throughout. Add a teaspoon of the blue sugar; spread throughout the pan. Melt the Wilton Candy Melts as instructed, put inside a plastic Ziploc bag, and zip it up. Cut one corner end of the baggie to use as a piping instrument. Squeeze the red melted candy over the popcorn. – Stan Lee Outtakes – Stan Lee tries out a series of hilarious one-liners for the scene in which his car shrinks. I’d love to win, because I haven’t seen this movie. I would love to win so I can rewatch this movie with my niece and nephew. They both really enjoyed this movie. I haven’t seen this movie but would love to have an at home date night with my husband who loves all marvel movies. My husband would love this movie! Perfect Stocking Stuffer! I would love to win because this is my kids and husbands favorite kinda movie and would make for a great family night! I want to win for my nephew. I’d love to win because my daughter loves this movie. I have not seen the movie yet and would love to! It’s so great to see a female superhero who gets the job done! Girl power! We enjoyed the first Ant Man movie, so I’m sure the second would be great too. We haven’t seen this movie yet in our house and are looking forward to it. Thank you for the chance to win. Would love to share this movie with the kiddos! I would love to win this for my son. We have not seen this movie yet! I would love to win, because I’m a HUGE fan of BOTH Ant-Man movies! I would love to win this because we love super-hero movies and this would be perfect for family movie night. I would love to win this for my son, he loves the movie. The kids are wanting to see, like to win for them. I would love to win this because I watched the first movie with my grandson and we both loved it. I think we would love this one too,plus it a great way to make special memories with my grandkids. Saw it a few times and loved it enough to add it to my collection. I’d like to win because I’d like to watch this with my family. I loved Ant Man and the Wasp! I think it’s a MUST OWN for our collection. I really like that party idea, too, thanks! I’d love to win because I’ve been wanting this movie! My husband wants to see this movie. I’d like to win for him. Would be a good family movie to watch with my granddaughter. I saw this movie in the theater with my youngest son and we loved it! My hubby and other kiddos really want to see it too and this would be great for family movie night! 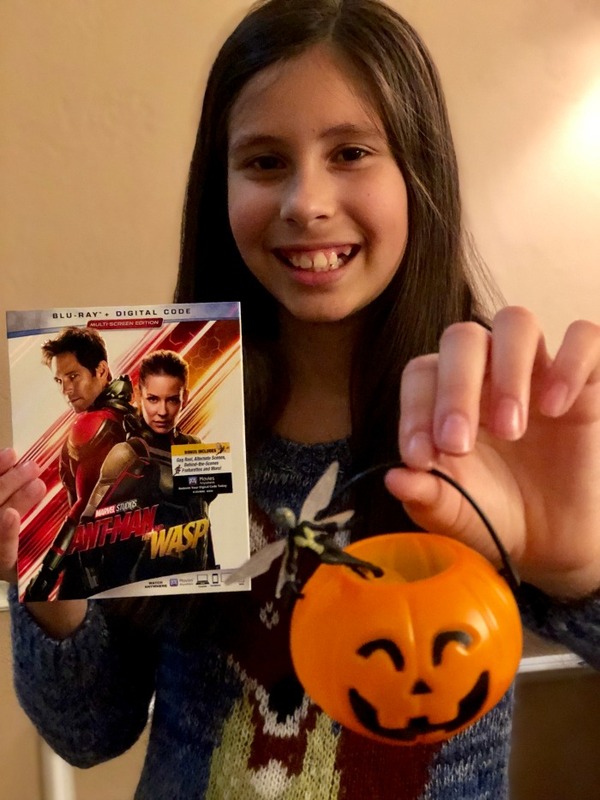 I would love to win to gift the movie to my daughter! I would love to win because I loved Ant-Man. This would be a good family movie. I would love to win this so that my family and I can enjoy this awesome movie more than once. I loved the first movie, and I can’t wait to see the second one. Marvel always does a great job. I have 3 daughters. Two of them are very girly and into all thing sparkly. The other likes to get down and dirty, read comics and build legos. One of her most favorite things is all the superhero movies. She would love this! We missed this in the theaters and heard it was really good! I’d like to watch it with my family. I’d like to win because my family loves Marvel movies. I’d like to win because we love all Marvel superhero’s and would like to add this to our collection. I would love to win this for my hubby who loves these types of movies! My son and husband would like to watch this together. Its hard for us to find a movie that hubby and I can both agree on. But he has said that Ant Man looks good! I would love to win this for my nephews. Thank you for the chance! I’d love to win because I’m a fan of Paul Rudd. This movie is so fun and cool with a ton of special effects, its absolutely amazing! Would love to add it to the family collection. Would love to win for my sons. Would love to win since we haven’t seen this movie yet. I would love to win and watch this movie with my grandkids on one of our movie nights. Thanks for the chance. My kids haven’t seen this yet! I’d love to win because mt husband and I love Marvel movies, and this was one we missed in the theaters! I want to win because I love adding movies to my collection. My grandkids would love as they love Marvel movies. I love Marvel movies and haven’t seen this one yet. I would like to win because I’m a huge Marvel fan. I haven’t seen the second one yet, but would love to. I have a huge thing for Paul Rudd, yum! The man hasn’t aged since Clueless, wow. I would love to win this giveaway because I loved the first Ant-Man movie and I still haven’t seen this one! I would love to win this and watch it with my family. I have been wanting to see this movie for a while now. The reviews say it is a good movie so I would like to see it. I would love to win this for my husband for his Christmas present. I commented on Christopher Robin Blu Ray. I have heard this was good and would love to see it! Because it is a movie worth seeing more than once…any time I wish! The Wasp is my favorite Marvel character and she is great in this movie! Because we just caught up on all the Marvel movies! I would like to win this awesome movie for my nephew. I’d like to win because I loved the first movie! My family would love to own this. It’s always exciting to win. I would love to win to watch this with my son. I commented on Halloween DIY Frankenstein Clay Pot. I’d love to win because we haven’t seen it yet but looking forward to watching it. Sound like a good movie that we would really enjoy. i would love to win this for my son! hes obsessed with ant-man! We have not seen this movie so it would be great to win it. I would love to win this because we haven’t seen it yet!! It would be good for our family movie night! I would like to win because my daughter would love to have this movie! My family loves Ant-Man and his daughter Cassie. We’d love to win this so we can watch it at home for Family Movie Night! Thanks for the opportunity!! We have not seen this and I really would like to. My children and I loved Ant Man and we would love to see this one….often! 🙂 Thank you. I have young grandchildren that will love it! It is such a fun movie we want to see it again. Because Ant Man has always been my favorite. I HAVEN’T SEEN THIS YET, AND I WOULD LOVE TO WIN IT AND WATCH WITH MY FAMILY! I would love to win this to watch with my family! I would like to win because it would be a great movie for family movie night. Id love to watch this with my family for movie night! I am dying to see this! missed it at the theater! Gotta see it soon! My family would love to watch this together. I would like to win because I have yet to see the movie. My grandchildren would absolutely like to see the cool Ant-Man and The Wasp movie.. I have grandchildren that would definitely like to watch an amazing Ant-Man and The Wasp movie. My nieces and nephews would really enjoy viewimg the marvelous and great .Ant-Man and The Wasp mövie. A wonderful Ant-Man and The Wasp movie, my grandchildren would like to always watch for lots of fun,. I have nieces and nephews that would enjoy seeing a fabulous Ant-Man and The Wasp movie many times. My many children would just like the awesome Ant-Man and The Wasp movie for fun viewing.